A few observations. First of all I can't get over how dirty the floors are in the two pictures (the one on top of the Greenbriar logo, and the one with Groucho and the chorines). It seems odd that with all the attention to detail when making those films, (like makeup, lighting, art direction) that they wouldn't have noticed that the floor could have used a good buffing. BTW I've heard the Ginger and Fred DVDs reveal they had dirty floors too. 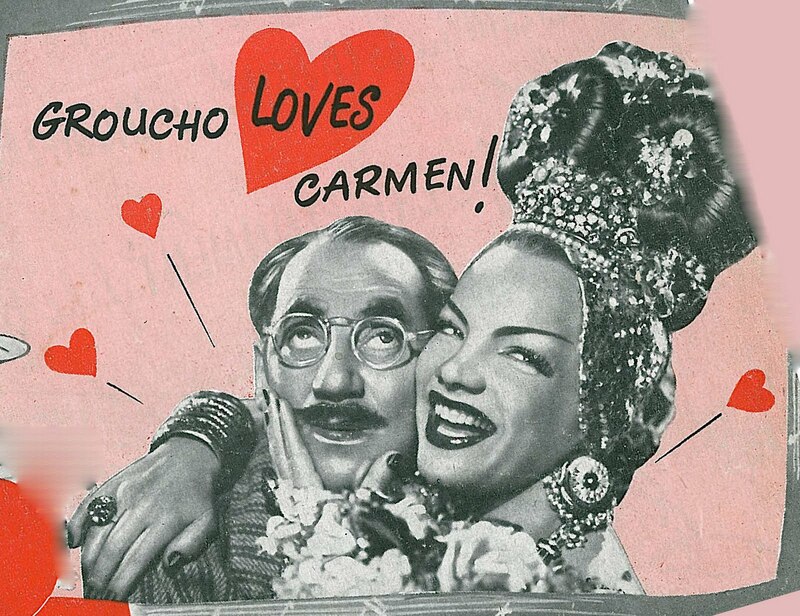 In the next to the last picture, I think, that has both Groucho and Carmen along with a bunch of girls in it, shows Carmen Miranda's shoes. Those things had to be at least 5-6 inches at the heel. How could this woman stand much less walk in shoes with heels that high? Was she *that* short? I cannot believe that she performed musical numbers in those shoes. Yes I'm strange, I admit it. That's a very interesting point, sjack. I hadn't noticed the floor in these stills. I'd imagine that when they shot the dance numbers, the floor would have been polished ... then later, maybe days later, when the cast came back for stills, the floors were left as they were and not re-polished. 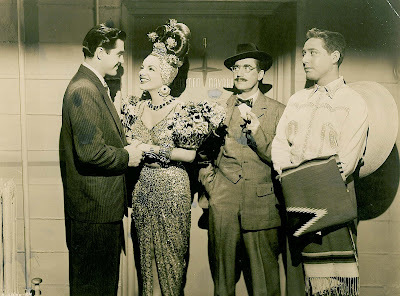 My guess is with so much else going into detail ,that floors were the last concern(just try not to film that low)..yet on this one,it looks like you can see the marks on the floor for Groucho's feet in the 3rd down left foto..
Just picked up a photo of Cesar Romero spinning Carmen Miranda on a dance floor. The photo reveals that Carmen left her "undies" in the dressing room, and her entire "tutti-fruitti" is showing. So SOMEBODY likes this film.I think "Go West,Young Man" was part of the discarded Kalmar/Ruby script for GO WEST (At least one author lamented that the aformentioned script wasn't used, but I've heard It wasn't really that great).Remember when COPACABANA was reissued in 1973 on a double bill with NIGHT IN CASABLANCA? 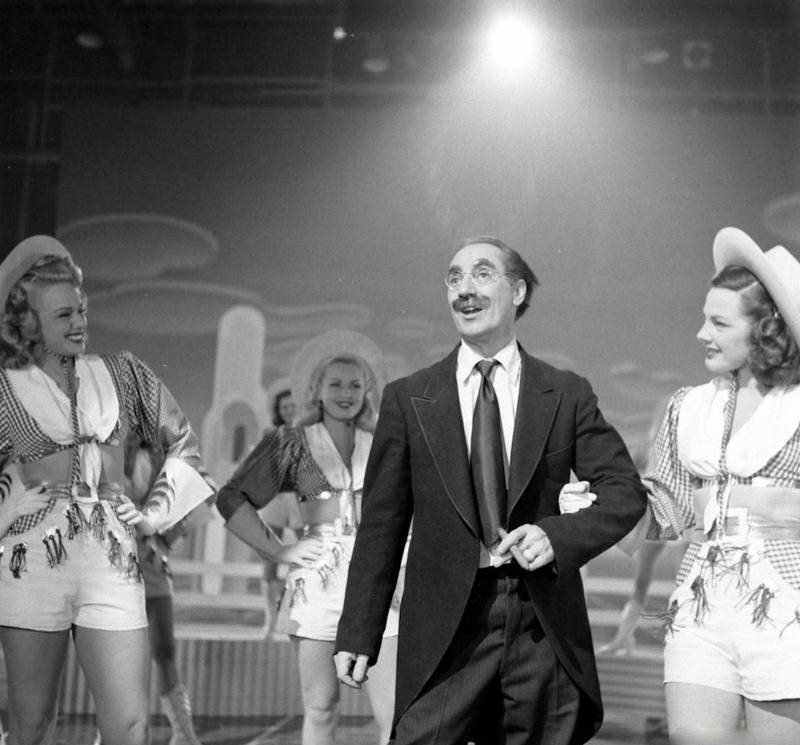 Remember when kids knew who the Marx Brothers were? 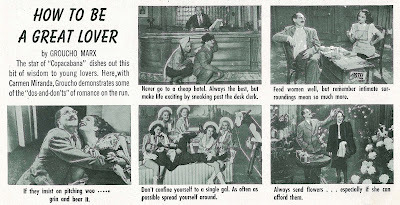 My 14-year old daughter knows who the Marx Brothers are -- and they leave her cold. She's happy to watch old movies -- Laurel & Hardy, Hitchcock, Sherlock Holmes, Mr. Moto... but forget the Marxes -- even their Paramount movies. I saw COPACABANA in a theatre back in the 1970s, and I was amazed by how they managed to make Groucho look so young during the performance pieces. Seeing the still from that scene in your post, it appears I may have been too easily amazed back then. 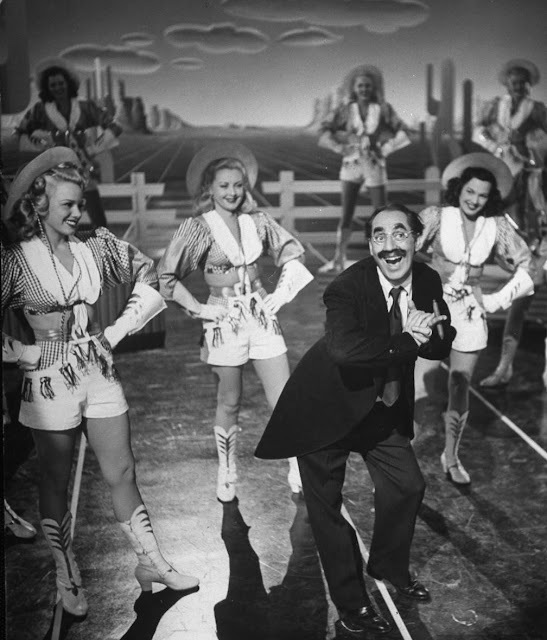 Cladrite, I think Groucho still looks good in his "Go West, Young Man" number. Considering the success of "A Night In Casablanca," the previous year, I'm surprised he and the Brothers weren't prevailed upon to follow up on it (notwithstanding the several year's later "Love Happy," which was not so successful). I remember when A Night In Casablana premiered on TV about 1973..It was a pretty big hit.Suddenly Harpo is famous for the "whatya think you're doing?..Holding up a Wall? "gag..Martin and Lewis's Artists and Models premiered about that same time on that major primetime network..Also in around that time,Animal Crackers was back in circulation and playing major theatres.. I was an usher (and a relatively newly minted Marxist) at a multiplex when ANIMAL CRACKERS was rereleased in, what, 1974? I spent hours on end on quiet Saturday afternoons watching AC over and over, only occasionally peeking out to see if the mostly absent theatre manager was on the prowl. It seems in retrospect as if the run was a lengthy one -- three or four weeks, perhaps -- though that seems odd to me now, since it wasn't drawing anything like packed houses. To this day, I can come pretty close to reciting all the dialogue verbatim while watching that movie. 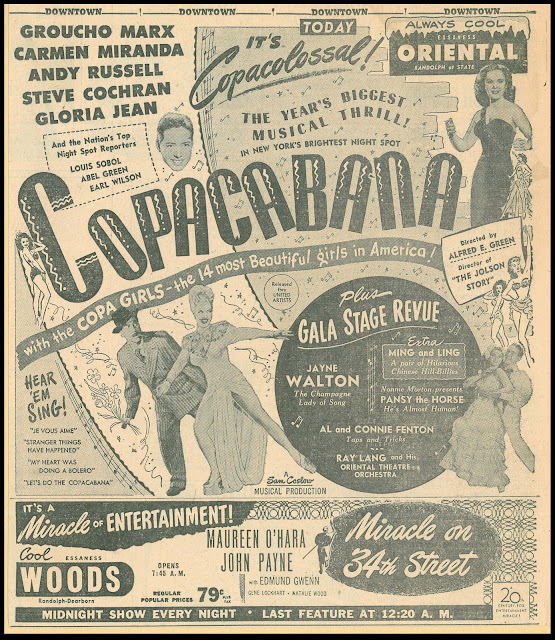 COPACABANA was released on May 30, 1947 (filmed between November 22, 1946 and January 22, 1947), but listeners of the radio program "Philco Radio Time" on February 12, 1947 got a preview of the song "Go West Young Man!" 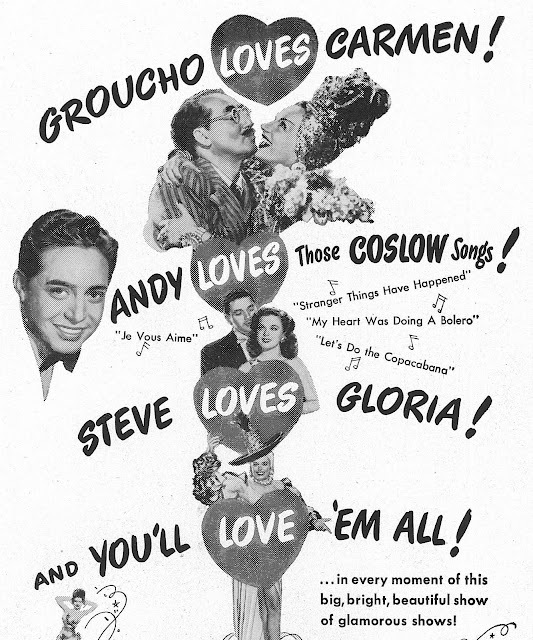 when it was performed on that show by Bing Crosby with guest Groucho Marx, accompanied by John Scott Trotter's Orchestra (show recorded January 27 & 28, 1947). Incidentally, neither Bing nor Groucho mentioned that the song is from Gorucho's forthcoming movie. Bing Crosby also recorded the song for Decca Records on March 26, 1947, accompied by The Andrews Sisters, with Victor Schoen and His Orchestra (on Decca #23885). 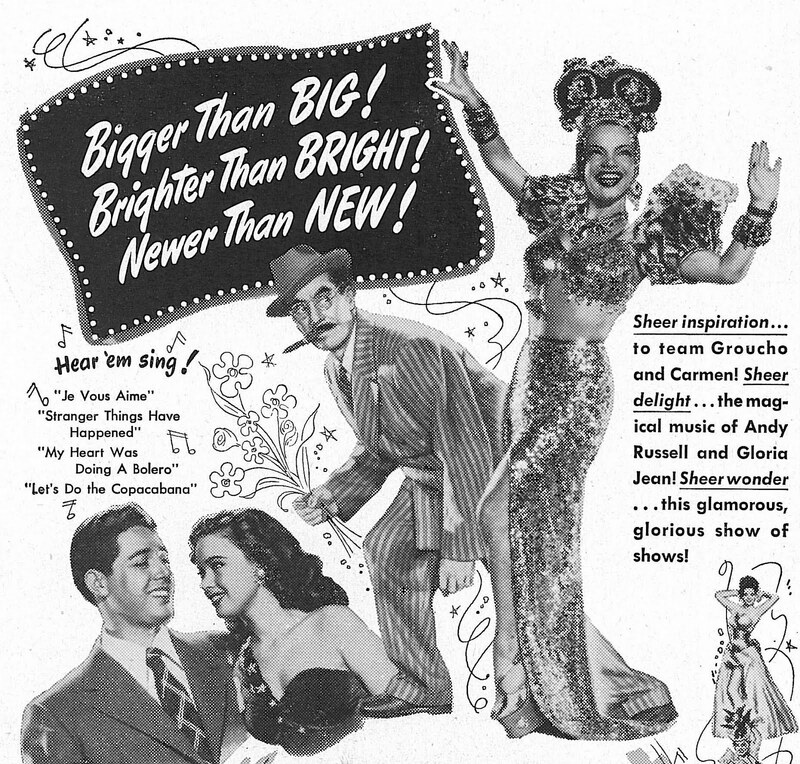 Some interesting alterations in lyrics between these different versions included the line about Dixie. It was completely replaced in some versions (presumably to avoid ofending southerners?). Also the word Sudan was reportedly orignally Japan, but understandably changed, even if these recordings were post-war. As always, your added info is much appreciated, Richard. Look forward to seeing you at Slapsticon. Hi Jeff --- Do you still have that catalogue? 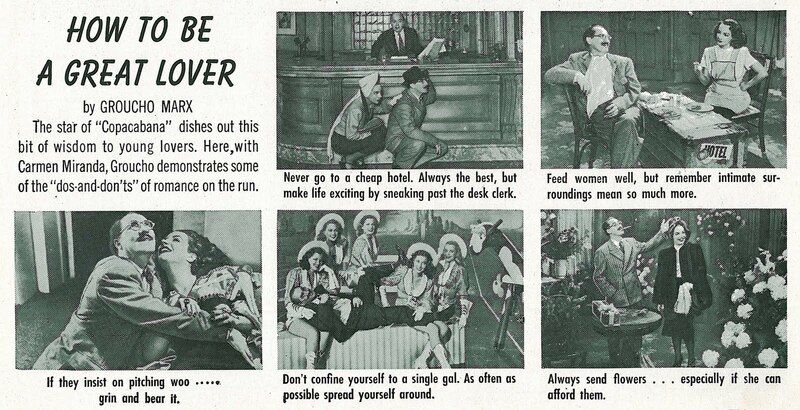 I'm doing a post on Oliver Hardy as a showman/projectionist, and would love to include that image if it's accessable. Thanks, John. Real guffaws are hard to come by in this film. Most of the supports are wooden. This film does look good, especially some of the dance sequences.